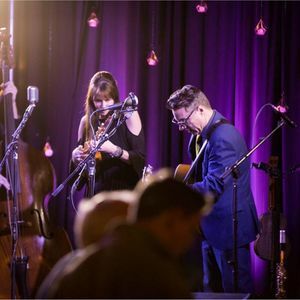 Kansas City darlings Victor & Penny join forces with good friend and Okie favorite Kyle Reid for an unforgettable night of high-energy swing, jazz, gypsy, and original tunes delivered with sterling musicianship and lots of laughs. Joined by their full bands - The Loose Change Orchestra and The Low Swingin' Chariots - expect foot-stomping musical surprises, comfortable seats, great sound, and room for dancing. Come early and stay late for dinner, drinks and the show. This is a seated show in Californos gorgeous main ballroom. Full dinner service is available in the upstairs dining room from 5-11pm. Bar service is available in the ballroom throughout the night.